Start off your visit on the 5th (Fri): examine the collection at National Museum of Art and History (Musee National d'Histoire et d'Art), explore the historical opulence of Palace of the Grand Dukes (Palais Grand-Ducal), take in the spiritual surroundings of Notre Dame Cathedral (Cathedrale Notre Dame), then get to know the fascinating history of Le Chemin de la Corniche, and finally contemplate the long history of Casemates du Bock. For ratings, more things to do, maps, and more tourist information, use the Luxembourg City trip builder website . If you are flying in from Luxembourg, the closest major airport is Luxembourg-Findel International Airport. In April, daily temperatures in Luxembourg City can reach 15°C, while at night they dip to 5°C. Wrap up your sightseeing on the 5th (Fri) early enough to drive to Rouen. 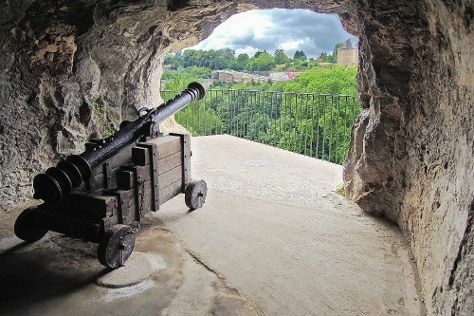 Start off your visit on the 6th (Sat): admire the masterpieces at Musee des Beaux-Arts de Rouen, test your team's savvy at popular escape rooms, look for gifts at Fayencerie Augy, then don't miss a visit to Vieux, and finally don't miss a visit to Les Racines du Ciel. Get ready for a full day of sightseeing on the next day: take in the spiritual surroundings of Cathedrale Notre-Dame de Rouen, don't miss a visit to La maison sublime, appreciate the history behind Gros-Horloge, wander the streets of Rue du Gros-Horloge, then steep yourself in history at Place de l'Aitre de St. Maclou, and finally make a trip to Rue Saint-Romain. To see ratings, maps, and other tourist information, refer to the Rouen trip planning site . Getting from Luxembourg City to Rouen by car takes about 5 hours. Other options: take a train; or do a combination of flight and train. In April, plan for daily highs up to 17°C, and evening lows to 5°C. Finish your sightseeing early on the 7th (Sun) so you can drive to Etretat. Start off your visit on the 8th (Mon): take in the dramatic natural features at The pinnacle L'Aiguille creuse, make a trip to Chemin des Douaniers, then get great views at Falaise d'Etretat, and finally explore the striking landscape at Porte d’Aval. For ratings, where to stay, more things to do, and tourist information, read our Etretat trip itinerary app . Drive from Rouen to Etretat in 1.5 hours. Alternatively, you can do a combination of train and bus; or take a bus. In April in Etretat, expect temperatures between 15°C during the day and 7°C at night. Finish your sightseeing early on the 8th (Mon) to allow enough time to drive to Bayeux. Start off your visit on the 9th (Tue): look for gifts at Au Fin Gousier, then examine the collection at Musee de la Tapisserie de Bayeux, then explore the different monuments and memorials at Bayeux War Cemetery, and finally stroll the grounds of American Cemetery & Memorial. Keep things going the next day: take in the spiritual surroundings of Notre Dame Cathedral, then steep yourself in history at Pointe du Hoc, and then learn about all things military at Memorial of Caen. 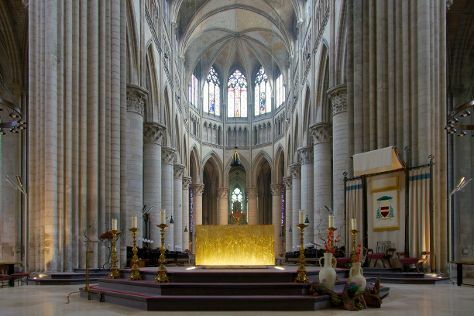 Plan a trip to Bayeux easily and quickly by telling Inspirock to suggest an itinerary. You can drive from Etretat to Bayeux in 2 hours. Other options are to take a bus; or take a train. In April, plan for daily highs up to 17°C, and evening lows to 5°C. Cap off your sightseeing on the 10th (Wed) early enough to travel to Mont-Saint-Michel. Le Mont-Saint-Michel is an island commune in Normandy, France. Kick off your visit on the 11th (Thu): don't miss a visit to Tour du Nord, then stroll the grounds of Huisnes Sur Mer Ossuary, then make a trip to Terrasse de l'Ouest, and finally admire the striking features of Mont Saint-Michel. 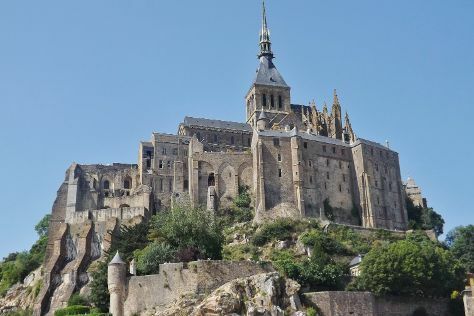 Discover how to plan a Mont-Saint-Michel trip in just a few steps with Inspirock's itinerary builder. Take a train from Bayeux to Mont-Saint-Michel in 3.5 hours. Expect a daytime high around 17°C in April, and nighttime lows around 6°C. Wrap up your sightseeing by early afternoon on the 12th (Fri) to allow enough time to travel back home.